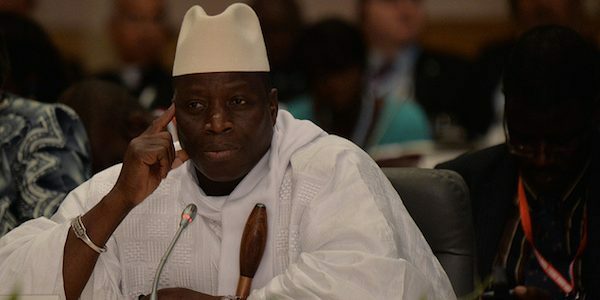 For asking him to step down for a democratically elected president, the Gambian leader, Yahya Jammeh, has accused West African regional body, ECOWAS, of declaring war against his country. Mr. Jammeh, who accused ECOWAS of putting forces on alert in case he refused to step down, has vowed to stay in power despite losing a December 1 election to rival Adama Barrow. He also promised to defend Gambia against any outside aggression, in a New Year speech broadcast on state TV. The veteran leader initially conceded defeat in the vote, then changed his mind days later – raising fears that regional powers might have to intervene to oust him. His mandate runs out on January 19. PREMIUM TIMES reported how President Muhammadu Buhari led other West African leaders to meet with Messrs. Jammeh and Barrow. Apart from Mr. Buhari, the ECOWAS delegation also had Presidents Ernest Koroma, Ellen Johnson-Sirleaf and John Mahama of Sierra Leone, Liberia and Ghana respectively. The leaders appealed to Mr. Jammeh to leave office and also reportedly sought a ‘honourable exit’ for him that would ensure he is not tried for various human rights crimes he is alleged to have committed while in office. Despite the visit, Mr. Jammeh remained defiant. Marcel de Souza, the ECOWAS Commission president, said last week that the body had put standby forces on alert. He apparently acknowledged again that the poll did not go in his favour. Mr. Barrow’s surprise victory and Jammeh’s initial decision to concede after 22 years in power was initially seen as a moment of hope on a continent where autocratic leaders are becoming more entrenched. Mr. Buhari has stepped in as an ECOWAS mediator to offer Mr. Jammeh an “honourable exit”, but the latter said the bloc could no longer fulfil that role.